All of these bears have been hand knitted using my own hand spun yarns, each is made from the fleece of different sheep breeds, stuffed with scoured & carded lambswool, so made from 100% natural materials. Each one is different from the others - all have a character of their own - it becomes evident when I embroider the faces on! The bears cost £40 each plus post and packing, that's about £5 to the UK, £11 to Europe and £12 to the USA (that's for recorded delivery, without recorded delivery it's about £5 to Europe and £7 to the USA). If you want to buy a bear, please use the contact form and we can sort out payment through Paypal. 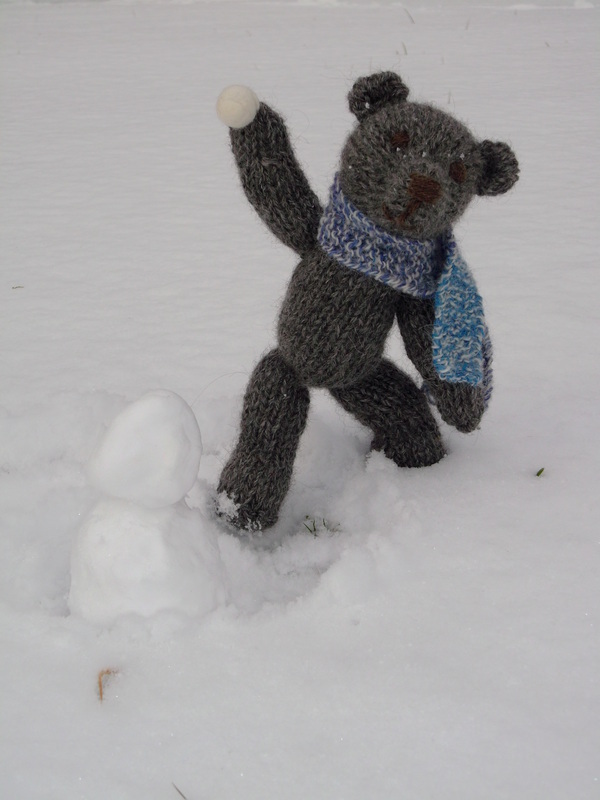 This bear is made from the fleece of Blue-faced Leicester sheep (bfl for short). The yarn is 3 ply barber pole, which means that I used a strand each of white, brown and oatmeal bfl and plied (or twisted) them together to form this lovely soft yarn. The scarf is made from hand dyed, hand spun Wensleydale fleece. The nose, eyes and mouth are embroidered using hand spun Jacobs yarn. 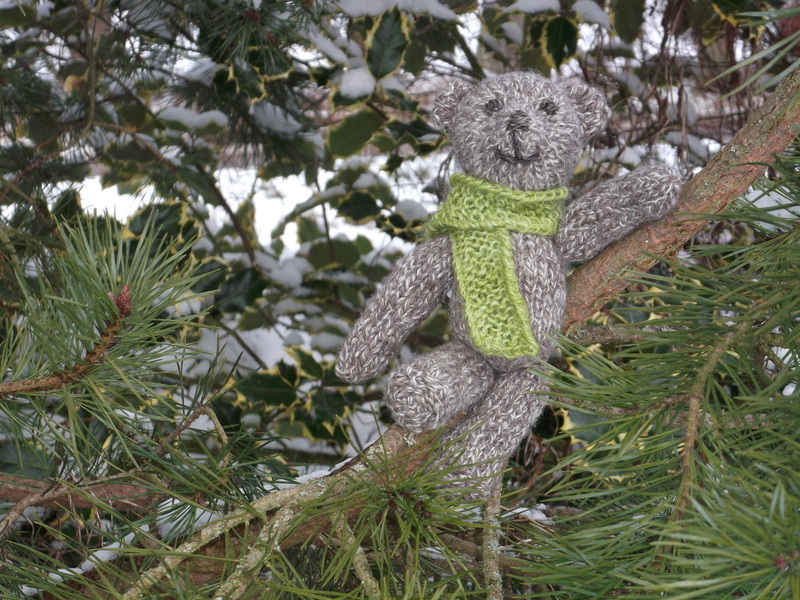 He is called "Beren Graegmael", which is old English and means "grey bear", he's a tree climber and a bit of a show off! He is about 24 cms tall and is a little over stuffed in the stomach department! THIS BEAR HAS BEEN SOLD - he has become a bear with two homes & travels between Spain & UK! 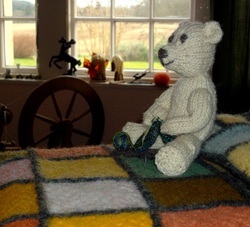 Mathan (that's Scot's gaelic for bear by the way) is made from a mixture of different coloured Shetland wool, spun all mixed up and made into a 2 ply yarn - that's two strands twisted together. 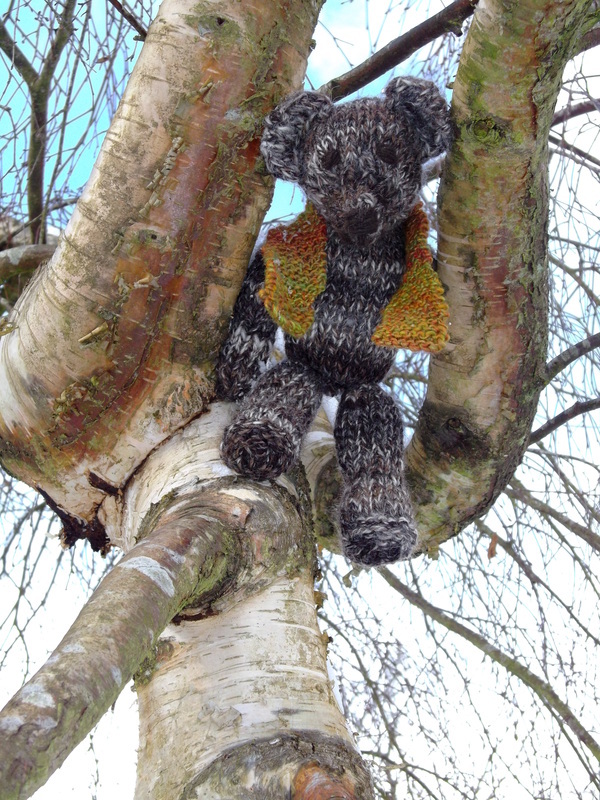 Like Beren Graegmael above, Mathan is also a tree climbing bear - he's a bit fitter though, so can climb much higher! He is wearing a scarf made from hand spun merino and silk yarn in lovely autumnal colours. His face is embroidered using hand spun Yak wool. Mathan is also 24 cms tall. 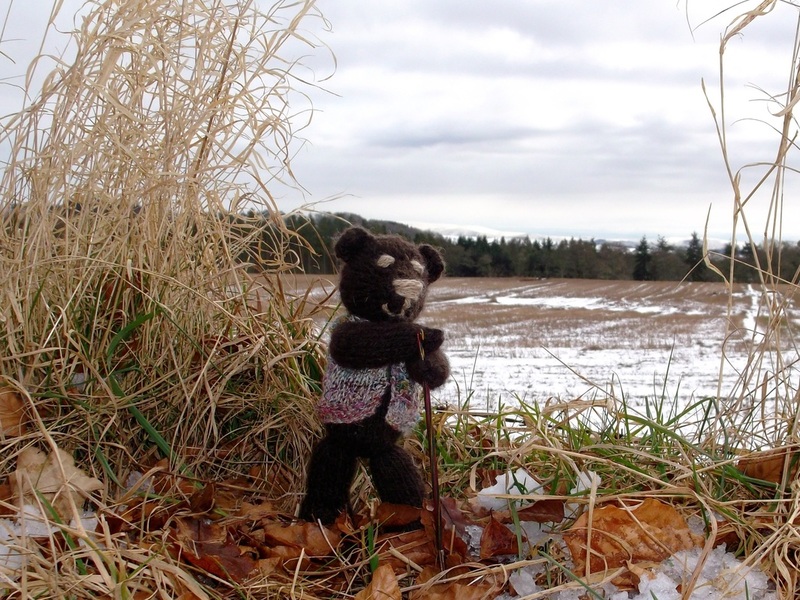 Bjorn is a Swedish bear made from the fleece of a Gotland sheep. The yarn is lovely and soft and he's a squidgy fellow. His scarf is made from a mixture of merino and massam fleece, once again, hand spun and hand knitted here in the Scottish Borders by yours truly. His face is embroidered using light brown Yak wool - yes, that's hand spun too. He's been having fun in the snow today so it's just like being at home for him really. He's a taller bear than the others, standing at a full 27 centimetres - that's the Scandinavian genes for you! Bjorn has now left home and moved to Durham. He still likes to get out in the snow and more recently has been spotted at the beach. Jack here is made from hand spun Jacobs fleece - a curious looking sheep with up to 6 horns on his head - check it out if you don't believe me! His face is embroidered with hand spun Yak wool and his scarf is a lovely purple silk and merino yarn. 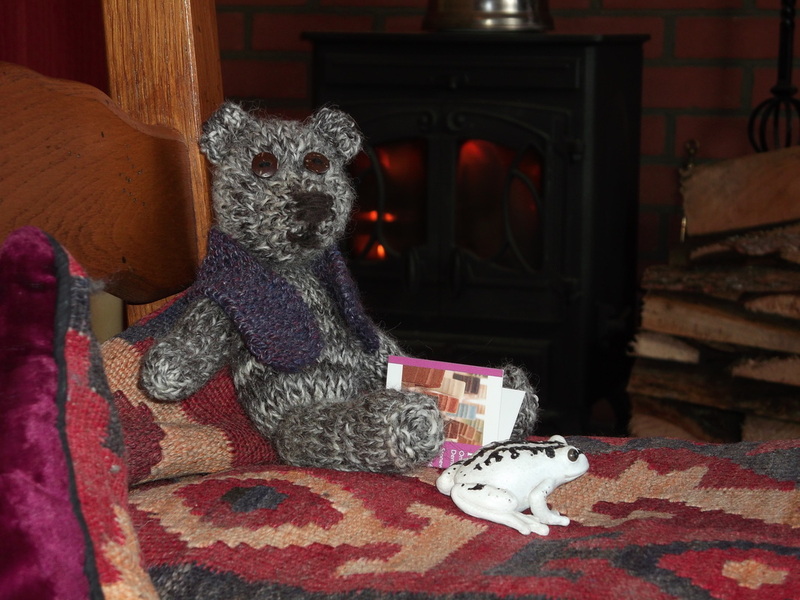 He's a bit of a home-comfort loving bear and likes nothing better than a comfy seat and a good book, curled up in front of a warm fire with his pet.....frog? Oh well, nothing as funny as folk! He is about 23/24 cms tall. Are you getting the gist of the naming of these bears yet? Jack and Harry are alliterative names, whilst all the others are linked with the language of the country of origin. So here we have Arth Du, which, if my research is correct is Welsh for Black Bear. That's because Arth here is made from the wool of the Welsh Black sheep, he too has a face embroidered with Yak yarn. His scarf however, is made from South American wool. Now, I'm not sure of the breed of sheep it came from, but it's so soft and squishy that it's likely to have a lot of merino in it and I think some Corriedale. That's an educated guess as there are lots of merino and Corriedale sheep in South America! 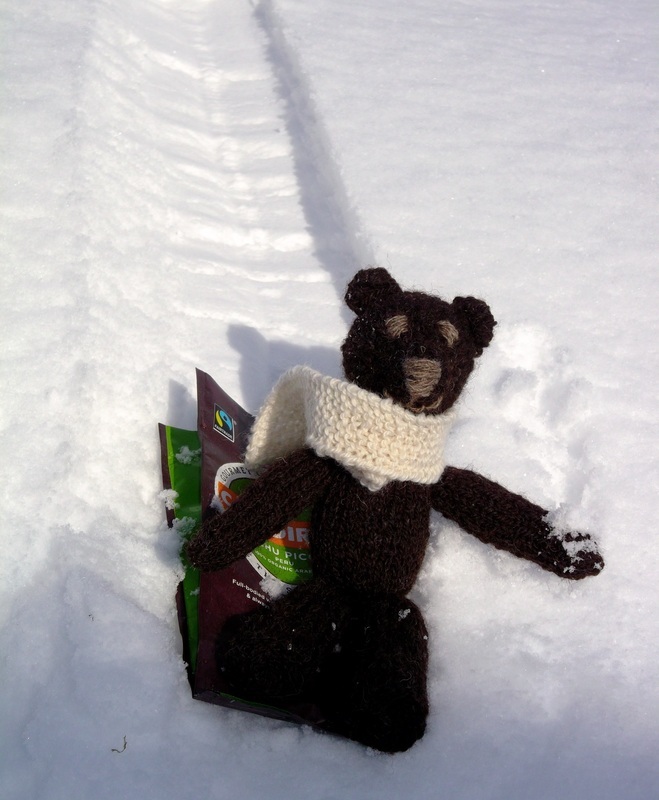 He's right at home in the snow and got the coffee bag out of the recycling to use as an improvised sledge - he's really having a lot of fun! Beren Rum is Old English for big bear, and this one is a little taller than the others at a huge 29 cms! He's made from a natural brown, Blue faced Leicester yarn, navajo plied - that's a three ply yarn but made by a method of plying one strand of yarn to make a thicker yarn. His eyes are blue merino and silk yarn and his mouth and nose are Jacobs yarn. His scarf is made from some beautifully soft hand dyed Polwarth yarn - so nice that I might just have to make myself one the same. He was the first bear I made so he's the start of the clan so to speak. 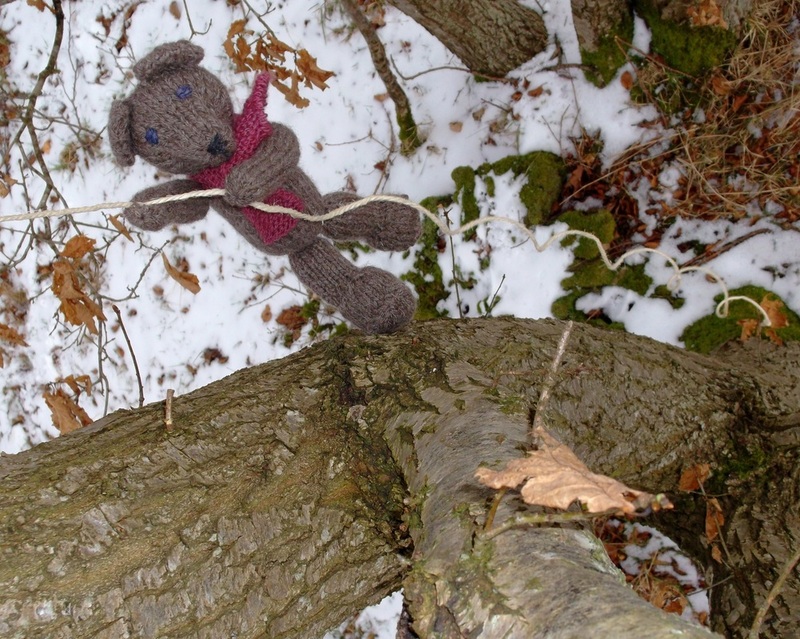 Another climbing bear like Mathan and Beren Graegmael - he's the rope man though! His face is embroidered using yarn made from camel down - such an exotic bear he is! He's wearing a fetching jerkin made from some recycled sari silk fibres all the way from India and which I spun up with some ramie fibres (that's a member of the nettle family by the way - you can spin anything these days!) to make a colourful garment, befitting the journeyman (or bear) that he is. Simeon Swaledale is made from the wool from the Swaledale sheep. He's an adventurer at heart and likes nothing more than an 'ike in th'ills wi'a picnic! He was quick to leave home and set up on a small holding in the Scottish Borders with a load of rare breed free range porkers! So long Simeon....and send us a card sometime!!! She's the same size as the others at about 24cms tall, made with natural white bfl hand spun yarn, navajo plied and her face embroidered using hand spun herdwick yarn. Harry hails from Cumbria, made from hardy handspun Herdwick wool then hand dyed this lovely rich heathery purple colour. 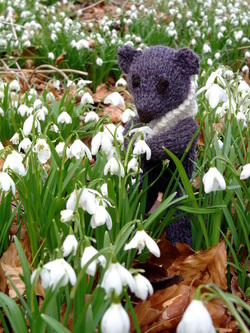 He's been out yomping in the snowdrops and has only just returned with this photo to show where he's been. He's had a great time, but now just needs somewhere to put up his weary feet and tell everyone about his great journey in Scotland!